There are a lot of folks protesting right now about the fact that the GOP's proposed healthcare law does not force insurance providers to cover pre-existing conditions. The fact that they're out there protesting tells me that they don't know a whole lot about insurance. I'm going to start with this and then give some alternatives. Perhaps after that you'll understand the insurance company's position (and it isn't "greed"). Pre-existing conditions should never be a part of any insurance plan. Because if you allow pre-existing conditions, it's not insurance. At its most basic, insurance is a bet. Let's take something other than healthcare as an example to remove the emotion from the equation. Every month, I bet State Farm that my car will be wrecked. Every month, State Farm takes that bet. Both of us ante up: my ante is called a "premium", which is set according to the odds; and State Farm's ante is held in their liquid assets... cash on hand for the purpose of paying off such bets. If my car isn't wrecked, I lose the bet, and State Farm keeps my premium. If my car is wrecked, then I win the bet, and State Farm pays the cost of repair or replacement. That's very simple, right? Almost indistinguishable from gambling. Now there are a few things that legally differentiate this bet from gambling, but I'll focus on just two to start: One is the idea of "insurable interest". As the insured, I have to suffer loss in order to win the bet. The other is the idea of "proximate cause". That is, the the reason for the loss must occur within the term (the effective dates) of the policy. That's because insurance is a hedge against uncertain loss. Take away the loss or the uncertainty, and it's not insurance. And again let's compare it to a bet so you can see it clearly. 1: Tim flips a coin and covers it so no one else can see it. William bets you even money that it's heads. Is that a fair bet? 2: Tim flips a coin and then shows it to William. William then bets you even money that it's heads. Is that a fair bet? Of course you wouldn't take the second bet. No one would. That's because the state of the coin is a pre-existing condition. It is something that you personally would never accept if you were offered the wager. You wouldn't even pretend otherwise. 3: You buy insurance, then wreck your car. You file a claim about the accident. The insurance company pays you and you use the money to fix your car. 4: You wreck your car, then buy insurance. You file a claim about the accident. You've committed insurance fraud and you are arrested. 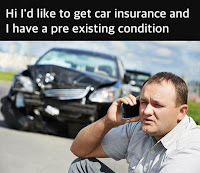 The reason for the insurance fraud in 4 is that the auto damage is a pre-existing condition. This is completely straightforward and logical and fair. Obviously so. Now let's look at a third legal point: mitigation. The insured person must treat his property as if it were not insured. In other words, he's required to take steps to avoid damage that would cause a payout. So if you own a car you have to drive safely, service it regularly, make sure it has oil and other fluids in it, keep the brakes in good repair, etc. This is your responsibility, and is not part of insurance. It also means you can't cause an "accident". You can't deliberately set fire to your property or fail to take reasonable precautions to prevent it from catching fire, etc. Otherwise the insurance company would not pay out, and would prosecute you. If these restrictions did not exist, it's blatantly obvious that anyone could simply wreck their car, go to the insurance company, plop down a premium... say a couple of hundred bucks... and buy a new car at someone else's expense. The insurance company would be paying out far more than they get in and would soon go out of business. In order to prevent that, they would first raise their premiums in an attempt to cover the losses. This would cause their legitimate customers to defect to other companies and hasten the demise of the idiots who allowed payouts without proximate cause. Since this is obviously detrimental to society, insurance fraud is illegal. The exact same thing is true of insurance when applied to healthcare. You're still making a bet, you're still hedging against uncertain loss, and the insurance company must still remain solvent. If you screw with any of that, then your premiums for legitimate customers skyrocket, their deductibles increase, and insurance companies are forced out of the market. This is exactly what we have seen happen in practice under the Affordable Healthcare Act... "Obamacare". It is not only mathematically inevitable, it is completely predictable, and in fact was predicted by many people in many places, including on this blog. And they were absolutely right. Part of the problem is clarity of language. Although much of what is lumped together as healthcare insurance is actual insurance, much of it isn't. Rather, it's a pre-payment plan. This isn't fiction. Read about the formative history of the Blue Cross and Blue Shield organizations and you'll see that these plans were created to increase the profitability of hospitals and doctors, respectively. It was to encourage people to use those services when they otherwise wouldn't have in the money-tight years of the Great Depression. So there are expenses included that are not the result of actual loss. These are are things like regular checkups or preventative medications and supplements. They are maintenance expenses that would mitigate actual insurance payouts. But because these prepayment plans are lumped in with insurance coverage, we've gotten used to calling the whole lump "healthcare insurance". Until the last few years, pre-existing conditions were still disallowed, for the same reasonable and fair reasons that it's disallowed in every other insurance venue. It is only in the emotionally-charged case of healthcare that people fail to call insurance fraud what it is and actively insist that insurance companies fall victim to this cheat. I'm using my words carefully here. If you want pre-existing conditions to be covered by insurance, then you explicitly endorse fraud and cheating. If this bothers you, it's not because you're upset by fraud; you're upset at being called out for it. I'm not saying this to insult you; I'm saying it because you need to think in new ways... ways that actually address and solve root causes. Consider this: no one ever buys a drill because he wants a drill. A person buys a drill because he wants a hole. When you consider the actual problem, it's clear that it doesn't matter whether you gain the hole by owning, renting, or borrowing a drill; or by lasering, sandblasting, punching, or pre-forming the hole. So long as you get your hole, the mechanism doesn't matter. Likewise, you have to ask yourself whether you want healthcare insurance coverage for every possible healthcare expense, or affordable, accessible healthcare. If you can pay $4/month at Wal-mart for maintenance medication, do you need to pay $50/month so that it's "covered" and paid for by an insurance company? If you could visit a doctor for a $50 office fee, do you need to pay an additional $200/month so that two checkups a year are included in your "coverage"? Should you force someone else to pay those maintenance fees for you? Just because something isn't paid for by insurance, that does not mean that it shouldn't be treated, or that people should be allowed to die, or that people who want a robust and viable insurance industry want you to die. None of those things need be true. It simply means that we should find a different way of paying for it. You have to think about the actual problem. And the problem is not insurance. And if it were, institutionalized insurance fraud is not the way to "fix" it. Rather, it's a guaranteed road to a permanently broken system. There are multiple ways of addressing the actual need. In socialized medicine, it's simply payed by taxes. You could put the providers on the government payroll and pay them a salary. Now you're not limited by the payments, but by the number of service providers, hours in the day, and demand. Obviously this raises taxes, but it does not require you to pay for everyone. We currently have single-payer means-tested social medicine programs in the United States in the form of Medicare and Medicaid. 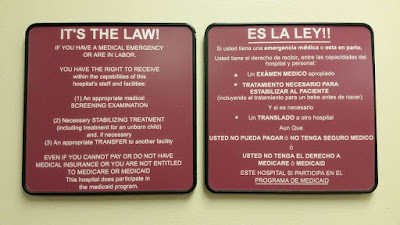 And for decades, no hospital that accepts government funds in this country has been allowed to turn away a patient in immediate need of care. 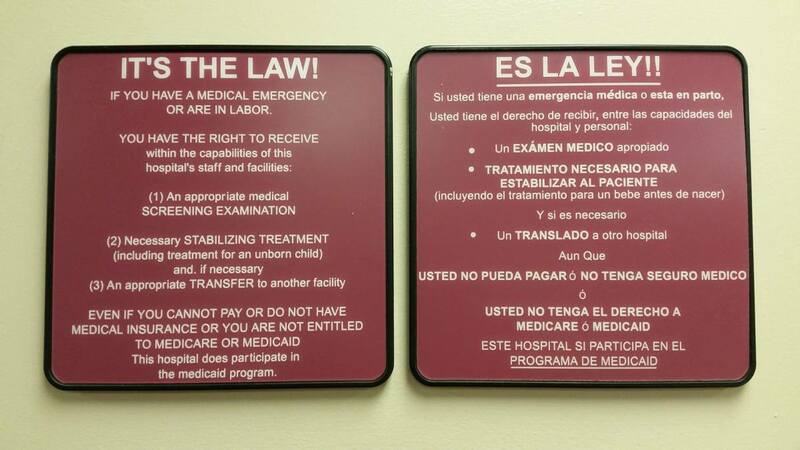 That's the law, and it's posted at or near the entrance of your nearest emergency room. Go look. That's the truth that's swept under the rug. But rather than focus on improving these programs -- which are literally intended to solve the very problems that the ACA attempts to address -- the architects of the ACA instead decided to break healthcare for everyone. That was just flatly stupid. Every hospital posts a notice similar to this one. In addition to these programs, there are other workable solutions. One way is through privately or publicly funded charities. We know this is possible because we do it today. The Shriners famously operate 22 children's hospitals. Only about 15% of their budget comes from public grants. The rest is derived from dues willingly paid by Shriners and by voluntary contributions to their fundraising efforts. No child is ever billed for their services. Not directly, and not through their insurance companies either. The same is true of RiteCare provided by Scottish Rite masons for preschool children with language disabilities. Not one cent is ever demanded from a patient. The same is true of St. Jude's Children's Research hospital. The point is that we know that alternative methods work and that they are viable and that they solve the actual problem of health care for their patients. Innovative solutions like these and others are overlooked in the broader healthcare market because people have been trained to jump blindly past the issue of whether breaking private insurance is a good idea to focus on how to break it in the most egregious manner possible. They don't think of it that way, but that's what they're doing. Furthermore, many people have been taught that it is not their responsibility to look after their own bodies... that they have a "right" to have someone else do it for them. They actually take more personal responsibility for their cars than they do for their lives, and they think this is somehow normal. That's a societal illness of its own, and it needs to be fixed as part of the overall solution. Of course helping people is a priority; but "help" requires some personal accountability by definition. Insurance is one of the most historically precise industries there is. Actuaries account for everything, be it cause or correlation. When they set odds it's because that's what the odds are. The wishful thinking of government legislators cannot change them. The wishful thinking of people who desire free money cannot do better. Honestly, I think the best thing we can do about private insurance is leave it alone and address the problems of the uninsured independently. That won't happen until you recognize what those problems actually are. Remember to reserve some energy to stir up those of your Republican friends who think it's possible to "fix" the ACA.